Jelly Bean Cookies are a fun and tasty snack, that probably aren't too favourable on your thighs, but certainly tempt your tastebuds. So when you want a colourful treat to perk up your day, why not try baking a batch of these. You'll find that the kids will love eating these, and helping you make them. So grab a packet of jelly beans and get baking. This recipe makes around 24 cookies. 1. Preheat the oven to 180º, and cover two baking trays with baking paper. 2. Using an electric mixer, or electric beaters, beat the softened butter, both sugars, and egg yolk until smooth, light, and creamy. Add in the vanilla bean paste, and then continue to beat until combined. 3. Add in the flour, mix with a metal spoon, and then with your hands, until combined. Add in a handful or two of jelly beans. Cover dough with glad-wrap and place in the fridge for 20 minutes. 4. Remove cookie dough from fudge, and roll into balls, using about one tablespoon of cookie dough each. 5. 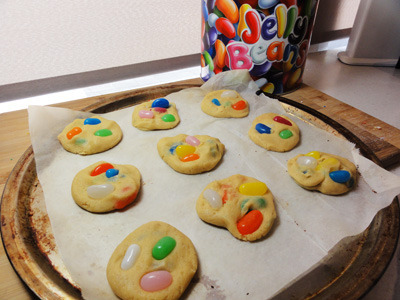 Lightly flatten balls on baking tray, and press three jelly beans into each cookie. Make sure you leave enough room between cookies on the tray, as they will spread. 6. Put cookies in the oven. After 15 minutes remove cookies from the oven, leave them to stand for around 5 minutes, then transfer them to a cooling rack. 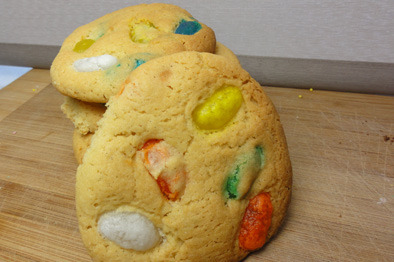 The cookies are crumbly, and full of the flavour, but the jelly beans give them a nice chewy texture. If you want jelly beans with the most flavour, go for the blue ones, and you may want to consider leaving out any black jelly beans. Once the cookies have cooled down they are ready to eat, or store them in an airtight container to enjoy later. 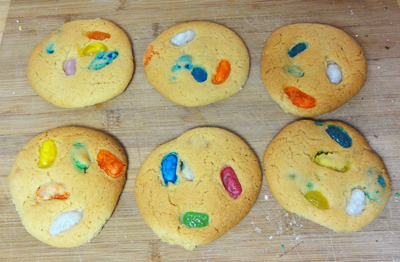 If you're not sold about the idea of jelly beans in your biscuits, then split the mixture in half. Make one batch with jelly beans, and the other batch with milk and white chocolate bits. Everything else is the same. One of them is sure to keep you happy. Yum! Cruel to read when you're pregnant!